This start to a new police procedural series has hooked me, and I already purchased the next three audiobooks in the series and can't wait to read more! 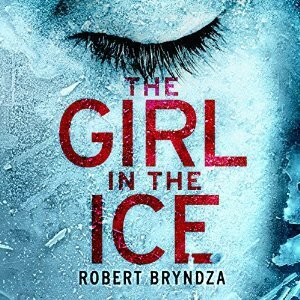 As you can see from the title and the cover, a young girl is found in the ice. She had been reported missing four days earlier, and she was violently attacked and killed. DCI Erika Foster from Manchester Metropolitan Police is called in to lead the investigation because of her experience. Foster uncovers similar attacks on other women, which were cold cases that were previously unconnected. This puts her in jeopardy, and she has to figure out who the killer is before he gets to her. On a personal level, Foster has returned to work following a leave of absence after the death of her husband who was working a case with her. She still suffers from nightmares, and the guilt gnaws at her. She's definitely a flawed and broken character, which makes her a great heroine! Bryndza is new to me, and I really enjoyed this one! As Foster investigates the crime, more and more layers are added to the story. There were lots of interesting characters, and I especially liked Detective Moss and her loyalty to Foster. I hope we see more of her in the next book in the series. 4 stars!! It was really good, and you should put it on your TBR list if you enjoy mysteries and/or police procedurals.